Bruce Marshall, a former Bituminous Engineer with the Mississippi State Highway Department, formulated the concepts of the Marshall method of designing paving mixtures. The U.S.Army Crops of Engineers, through extensive research and correlation studies, improved and added certain features to Marshall’s test procedure, and ultimately developed mix design criteria. The original Marshall method is applicable only to hot-mix asphalt paving mixtures containing aggregates with maximum sizes of 25mm or less. The aggregate size more than 25mm use the Modified Marshall method. This method covers the measurement of the resistance to plastic flow of cylindrical specimens of bituminous paving mixture loaded on the lateral surface by means of the Marshall apparatus. 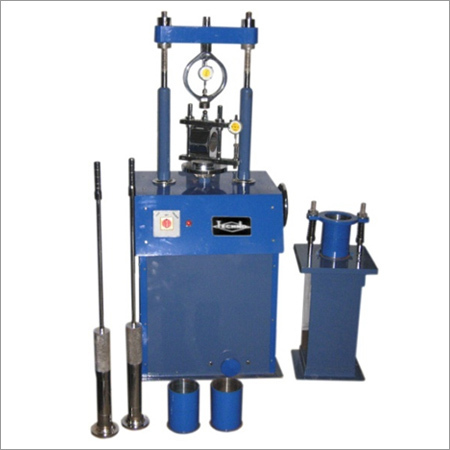 To determine the stability, flow, voids, voids in mineral aggregates, voids filled with asphalt and density of the asphalt mixture by Marshall stability test. a) Specimen Mould Assembly – Mould cylinders 101.6mm(4 in.) in diameter by 75mm(3 in.) in height, base plates, and extension collars. b) Specimen Extractor – Steel disk with a diameter 100mm, and 12.7mm thick for extracting the compacting specimen from the specimen mould with the use of the mould collar. A suitable bar is required to transfer the load from the proving ring adapter to the extension collar while extracting the specimen. c) Compaction Hammer – The compaction hammer shall have a flat, circular tamping face and a 4.5kg(10 lb) sliding weight with a free fall of 457mm (18 in.). Two compaction hammers are recommended. d) Compaction Pedestal – The compaction pedestal shall consist of 200X200X460mm(8X8X18 in.) wooden post capped with a 305X305X25mm(12X12X1 in.) steel plate. The pedestal should be installed on concrete slab so that the post is plumb and the cap is level. Mould holder provided consisting of spring tension device designed to hold compaction mould centered in place on compaction pedestal. e) Breaking Head – It consists of upper and lower cylindrical segments or test heads having an inside radius of curvature of 50 mm. The lower segment is mounted on a base having two vertical guide rods, which facilitate insertion in the holes of upper test head. f) Loading Machine – The loading machine is provided with a gear system to lift the base in upward direction./ on the upper end of the machine, a calibrated proving ring of 5 tonne capacity is fixed. In between the base and the proving ring, the specimen contained in test head is placed. The loading machine produces a movement at the rate of 50mm per minute. Machine is capable of reversing its movement downward also. g) Flow meter – One dial gauge fixed to the guide rods of a testing machine can serve the purpose. Least count of 0.25mm(0.01 in.) is adequate. j) Thermostatically control water bath. k) Thermometers of range 0 – 3600C with 10C sensitivity. At least three samples are prepared for each binder content. The coarse aggregates, fine aggregates and the filler material should be proportioned and mixed in such a way that final mix after blending has the gradation with in the specified range. The aggregates and filler are mixed together in the desired proportion as per the design requirements and fulfilling the specified gradation. The required quantity of the mix is taken so as to produce a compacted bituminous mix specimen of thickness 63.5mm, approximately. Take the sample as mentioned above, and heated to a temperature of 1750 to 1900C. The compaction mould assembly and hammer are cleaned and kept pre-heated to a temperature of 1000C to 1450C. The bitumen is heated to temperature of 1210 to 1380C and the required quantity of first trial percentage of bitumen (say, 3.5% by weight of mineral aggregates) is added to the heated aggregate and thoroughly mixed using a mechanical mixer or by hand mixing with trowel. The mixing temperature may be 1530 to 1600C. The mix is placed in a mould and compacted by hammer, with 75 blows on either side (for light compaction it is 50 blows). The compaction temperature may be 1380 to 1490C. The compacted specimen should have a thickness of 63.5 +/- 3.0mm. Three specimens should be prepared at each trial bitumen content, which may be varied at 0.5 percent increments up to about 7.5 or 8.0 percent. Marshall Stability and Flow values: The specimens to be tested are kept immersed under water in a thermostatically controlled water bath maintained at 600 +/- 10C for 30 to 40 minutes. The specimen are taken out one by one, placed in the Marshall test head and the Marshall Stability value (maximum load carried in kg. before failure) and the flow value (the deformation the specimen undergoes during loading up to the maximum load in 0.25mm units) are noted. The corrected Marshall stability value of each specimen is determined by applying the appropriate correction factor. The following tests are determined first, to find out the density, voids, VMA and VFB. The specific gravity and apparent specific gravity values of the different aggregates, filler and bitumen used are determined first. Where, Gsb = Bulk specific gravity for the total aggregate. P1, P2, Pn = Individual percentages by weight of aggregate. G1, G2, Gn = Individual bulk specific gravities of aggregate. Where, Gse = Effective sp.gravity of aggregate, constant for all at 5% bitumen content. Gmm = Maximum sp.gravity of paving mixture determine by Vacuum pump test (ASTM – D – 2041). Pb = Bitumen content, percent by total weight of mixture. Gb = Specific gravity of Bitumen. a) Density ‘Gmb’ g/cc, b) Marshall Stability, S kg, c) Voids in total mix, Va %, d) Flow value, F (0.25mm units), e) Voids filled with bitumen, VFB % & f) Voids in mineral aggregate, VMA %. The values of flow and VFB are found from the graphs, corresponding to bitumen content OBC. All the design values of Marshall stability, flow, voids and VFB are checked at the Optimum Bitumen Content, with the specified design requirements of the mix. The highest possible Marshall stability values in the mix should be aimed at consistent with the other four requirements mentioned above. In case the mix designed does not fulfill any one or more of the design requirements, the gradation of the aggregates or filler content or bitumen content or combination of these are altered and the design tests are repeated till all the requirements are simultaneously fulfilled. The proportions in which the different aggregates, filler and bitumen are to be mixed are specified by weight or by volume for implementation during construction. Caution: Mixes with high Marshall stability values and very low Flow values are not desirable as the pavements of such mixes may be brittle and are likely to crack under heavy traffic. i) Water Sensitivity: The loss of stability on immersion in water at 600C. The allowable limit is minimum 75% retained strength. for wearing surfaces = 400. Thank you so much for sharing MARSHALL STABILITY TEST method with us. All the process you described in this post is fantastic thanks for sharing this valuable info with us.